Like the Crusades, the Medieval Inquisition was a continuation and elaboration of previous systems of Christian totalitarianism, the started with reign of terror which established Christian rule in Rome. The start of the medieval inquisition is generally dated to 1231 when Pope Gregory IX announced his Papal Bull Excommunicamus. The Excommunicamus (to read the Latin text click here) established inquisitorial courts answerable directly to the pope. These courts bypassed courts created by local Bishops, as had been Church practice until the thirteenth century. Inquisitorial courts were comprised of specially appointed, permanent ecclesiastical judges who carried with them the authority of the Catholic Church wherever they sat. Two inquisitors with equal authority bestowed directly by the pope were in charge of each tribunal, aided by assistants, notaries, police, and counselors. In the beginning, inquisitors were chosen exclusively from the Dominican Order, which had been created by Pope Innocent III. Later on, at the Council of Lerida in 1237, members of the Franciscan Order were also authorized to serve as inquisitors. In 1229, armed Cathar resistance to the Catholic Church fell in southern France. Thereafter the task of rooting out Cathar heresy fell to the Inquisition. Inquisition established its headquarters in Toulouse and hundreds of Cathars were burned at the stake. In 1252, Pope Innocent IV had decreed that the Inquisitors operated above civil law gave official sanction for the direct use of torture by church officials in the Papal Bull Ad Extirpanda. Another decree by Innocent IV demanded that all civil rulers and all commoners must assist the work of the Inquisition or face excommunication. The inquisitorial persecution of Jews began in 1232. Ironically, a theological dispute within the Jewish community of Provence, France led several rabbis to denounce the Jewish thinker Maimonides to the Dominicans. Happy to become involved, the Dominican-led court burned Maimonides' books. Eight years later, on June 25, 1240 in Paris, the Talmud was put on trial and condemned by an inquisitorial court. Two years after that, on June 6, 1242, twenty-four wagon loads of Jewish books were burned. The investigation and persecution of Jews became a common occurrence by Church inquisitorial courts in the centuries thereafter. The most famous period of inquisitorial activity began in 1478 with the initiation of the Spanish Inquisition. It is very important to understand that nothing really all that new employed here. What was new, however, was the scale of the mayhem and the political aspects of the situation. By means of clever political introgue King Ferdinand and Queen Isabella of Spain managed to get political control over the machinery of terror. Only the Inquisitor General was appointed by Rome. The motive behind the Spanish Inquisition was the consolidation of political power by Ferdinand and Isabella. For centuries Spain had been the home to numerous disparate religions and traditions, including Islam, Judaism, and Christianity. The use of religious persecution was therefore a political tool for uniting Spain under the monarchy. In this context, the so-called Conversos, Jews (and Muslims) who had allegedly converted to Christianity but who had been caught or accused of practicing their former religion, found that they were targets of the Spanish Inquisition. Thousands of Conversos lived in Spain as a result of its diverse ethnic and religious composition. Altogether, more than 13,000 Conversos were tried by the Spanish Inquisition from 1480-1492. Most of these trials were convened under the authority of Tomas de Torquemada, who was named Grand Inquisitor in 1482. Torquemada's name has become synonymous with the use of torture to extract "confessions" and the practice of executing heretics and Jews by burning at the stake, the so-called auto de fe, or act of faith. Torquemada also supported the complete expulsion of almost 100,000Jews from Spain, which occurred in 1492, the largest expulsion of Jews in Europe prior to Hitler's Holocaust. The Spanish Inquisition followed the expansion of Spain's empire into the New World of North and South America, leading to the so-called Mexican Inquisition in 1571 and the Peruvian Inquisition in the 16th century. The inquisition in Spain remained in operation until 1834. The Reformation caused a further escalation of the machinery of terror by the church. Pope Paul III was so alarmed by the spread of Protestantism in Europe, and especially Italy, that in 1542 he established in Rome the Congregation of the Inquisition. This institution was also known as the Roman Inquisition and the Holy Office. The Roman Inquisition was answerable directly to the pope and was headed by six cardinals. Its powers extended to the whole Church. The medieval Inquisition had focused popular forms of heresy. In contrast, the Roman Inquisition was concerned with enforcing academic orthodoxy in the work of theologians. The Roman Inquisition remained active within the Vatican and Italy in its first twelve years of existence. However, in 1555, with the ascension of Pope Paul IV, himself a former Inquisitor, the widespread pursuit of "suspects" began. Anyone under suspicion, including bishops and cardinals of the Church, could be investigated. Lists of books were created which Paul IV felt offended faith or morals, resulting in the first Index of Forbidden Books in 1559. The Christian campaign against paganism also manifested itself in the hunt for witches. Again, this was not new. However, Pope Gregory IX, the intellectual mastermind of the formal Inquisition also can be given credit for setting in motion the organized system of witch hunting as official church policy. 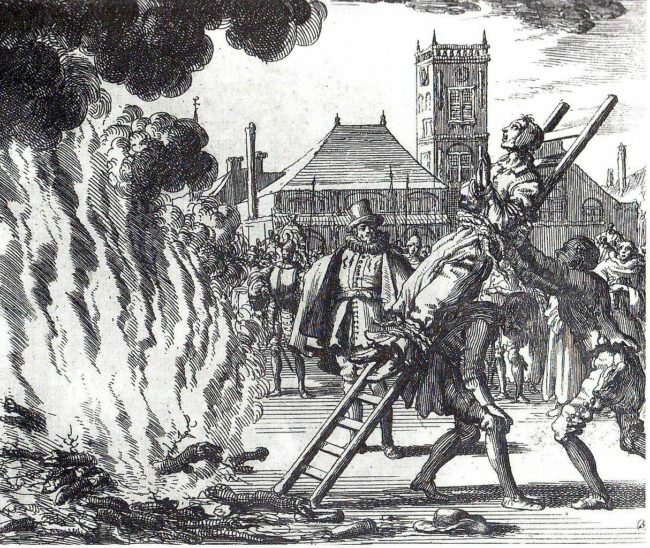 The persecution of "witches" took place in both Catholic and Protestant countries. However, witch hunting was particularly common in the Protestant Northern Europe. Recent scholarship has determined that toward the end of the 14th century rumors began circulating throughout Europe about an unholy conspiracy of witches, Jews, and Muslims to destroy Christianity. These rumors were in part irrational responses to the massive death caused by the Black Plague in the 1340s. However, the witch hunts were also central to Christianity's claim to complete dominance over the societies of Europe. In Christian societies no alternative religious traditions, especially paganism, would be tolerated. The first mass trials of "witches" occurred in the fifteenth century. The number of these trials then rose considerably in the mid-sixteenth century with the onset of the Reformation. The period between 1550 and 1650 has been referred to as "the burning times" in reference to the frequent burning of people accused of being witches. Witch hunting became particularly widespread in Central Europe during the Thirty Years War. In the province of Fulda, for example, the Lord Abbot of Fulda, Balthasar von Bernbach (a Catholic), led a mobile Inquisition in search of witches as part of his campaign against Protestantism. Within three years von Bernbach had put 250 witches to death. Protestants hunted witches as well. The anti-witch campaigns reached a climax in Germany in the 1620s. Around 900 were burned to death in Würzburg and around 600 in Bamberg. The latest scholarly estimates suggest that in the period between 1450 and 1750 as many as 50,000 trials and executions of witches may have taken place, with roughly 75% of these being against women. "It has indeed lately come to Our ears, not without afflicting Us with bitter sorrow, that in some parts of Northern Germany, as well as in the provinces, townships, territories, districts, and dioceses of Mainz, Cologne, Tréves, Salzburg, and Bremen, many persons of both sexes, unmindful of their own salvation and straying from the Catholic Faith, have abandoned themselves to devils, incubi and succubi, and by their incantations, spells, conjurations, and other accursed charms and crafts, enormities and horrid offences, have slain infants yet in the mother's womb, as also the offspring of cattle, have blasted the produce of the earth, the grapes of the vine, the fruits of the trees, nay, men and women, beasts of burthen, herd-beasts, as well as animals of other kinds, vineyards, orchards, meadows, pasture-land, corn, wheat, and all other cereals; these wretches furthermore afflict and torment men and women, beasts of burthen, herd-beasts, as well as animals of other kinds, with terrible and piteous pains and sore diseases, both internal and external; they hinder men from performing the sexual act and women from conceiving, whence husbands cannot know their wives nor wives receive their husbands; over and above this, they blasphemously renounce that Faith which is theirs by the Sacrament of Baptism, and at the instigation of the Enemy of Mankind they do not shrink from committing and perpetrating the foulest abominations and filthiest excesses to the deadly peril of their own souls, whereby they outrage the Divine Majesty and are a cause of scandal and danger to very many. We decree and enjoin that the aforesaid Inquisitors be empowered to proceed to the just correction, imprisonment, and punishment of any persons, without let or hindrance, in every way as if the provinces, townships, dioceses, districts, territories, yea, even the persons and their crimes in this kind were named and particularly designated in Our letters."